Baptism, Nursery Care, Youth Fellowship, Confirmation, Vacation Church School, Sunday Worship, and Adult Education are all a part of our never ending education at CCB. Click here for more info. CrossWays, our monthly newsletter, is available online as a PDF file. Click here for the latest issue. The Yankee Fair and Barn Sale at the Congregational Church of Brookfield will be Saturday, October 19 from 9:00 a.m to 3:00 p.m. at the crossroads of Routes 25 and 133 in the Brookfield Historic District. Click the tabs below to read about each committee. What does the Church House Committee do? CIS is responsible for communicating to the congregation local and worldwide social issues, outreach concerns or programs through events or education opportunities. The CIS Committee consists of 9 members of the congregation with one member on Church Council. 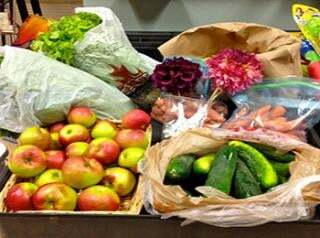 Church in Society allocates the budgeted and special monies raised for outreach concerns through some of the programs listed above. You can volunteer to assist the family living in our cottage for Refugee Resettlement. Purchase a pie or two for the holidays made to raise money for the Women’s Annual Mission Trip. Donate your gently used clothing items to the Thrift Shop. Donate towards the Annual Blanket Fund. If you have any questions, would like to suggest other outreach opportunities or to get involved. Please reach out to someone on the CIS committee. To serve as the Policy and Planning body of the church. Plans how we can best be a Church of Jesus Christ. Formulates Policy of the church. Is responsible for the ordinary business of the church between congregational meetings. Serves as the legal trustees of the church. Prepares, recommends, and oversees the church's operating budget. Is responsible for all personnel matters relating to church staff and pastoral relations. To nurture and care for the members and friends of the church, and to nurture the congregation's spiritual growth and actively pray for its members and their concerns. 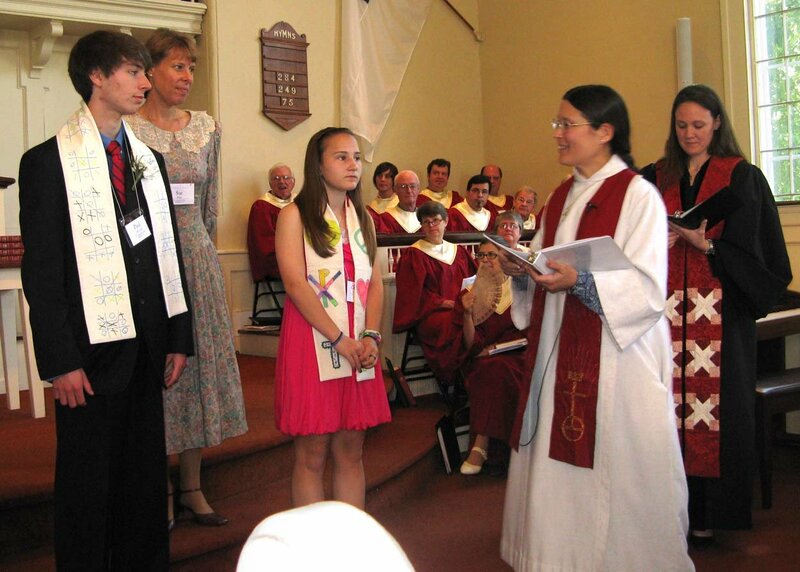 What does the Christian Education Committee do? What does the Fellowship Committee do? What does the Music Committee do? What does the Nominating Committee do? What does the Stewardship Committee do? Share, and see God’s spirit spread! 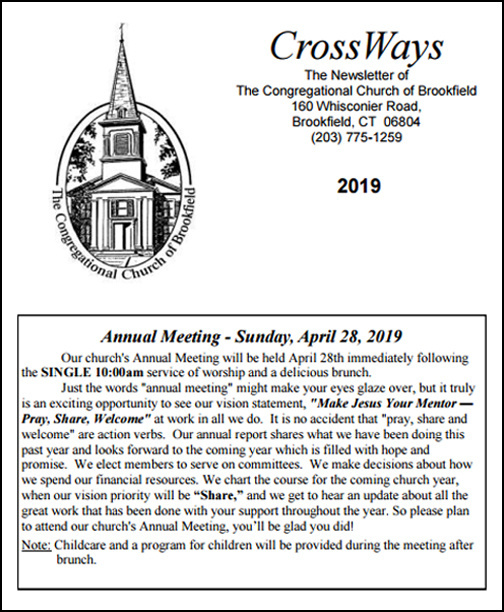 The Stewardship Committee celebrates your decision to enter into covenant with us as members of the Congregational Church of Brookfield, and we thank you for all you are able to SHARE with us just by your worship attendance and participation in our church life. We always ask members to complete a financial pledge so that we can make an estimate of our church’s annual income to our Church Council for their preparation of a responsible and accurate budget. With the financial support of each of our members, giving from the blessings God has shared with each of us, our church is able to carry out the work and ministries Christ has called us to do. NOTE: Our pledge year begins April 1. New envelopes become available in March. If you have any questions about pledging, please contact Sally Markiewicz, Stewardship Chair@ 203-775-6789 or speak with one of the pastors. What does the Worship Committee do? What does the Welcome Committee do? "If you could have seen the tearful eyes and heard the grateful words of thanks from the families as your donations were picked up, you would realize how deeply you have touched them"